Hi loves! Today's manicure features a polish that was created by a girl I love with one of the greatest blogs out there. This polish inspired me to do my first ever jelly sandwich in the past and when I sent her a care package she was so sweet and I received this in return together with a Wet 'n Wild beauty. Now she originally showed it by itself, but since I already was wearing a dark blue base I was curious how it looks topped on top of that. 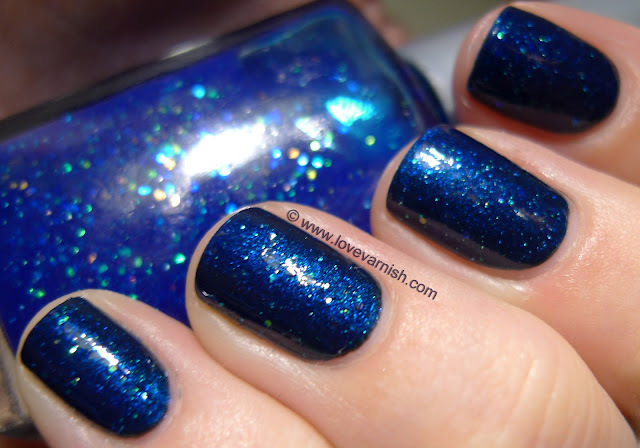 Let's take a look at Stargasm - created by Cristina from Let Them Have Polish! Gorgeous color! 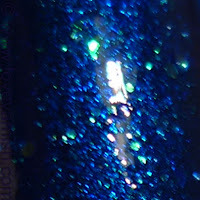 I see myself using this in a Christmas mani!! Oh yayayayayayayayay!!! Lovely, just lovely! Which reminds me... I should revisit mine soon :D! <3<3!!!! OMG...breathtaking!!!! This is supergorgeous!!!! "Cristina you're great!!!!" :D I am still so glad to have this! It is awesome right :D? This is so beautiful!!! How did I not know she made polish? I am sorry love, but she doesn't! This was just a franken she made for herself and she was sweet enough to make me some too!